In the past, W2C classes have focused on people with disabilites, so this was a new, but not unfamilair group for me. Addiction is an issue I have been close to, with fmaily and friends, in my life, so I felt an immeidate kinship with these women, and in the three Friday sessions, I am not sure who received more in terms of poetic healing, them or me! With my recent move back to Florida and the struggles that that now involves--to radically start over, I felt very aligned with the women. They have given up a great deal to "hit a bottom" as they say in the langauge of recovery, and now, they work kard to have faith in the slow personal transformation that unfolds day after day, a transformation that is not linear, that regresses as much as it progresses, a process that is often dark. One woman, K. said, "my poetry ain't pretty, Ms. Amber, it's what I tried hard to bury in me." She also wrote a gorgeous meditation on a free cup of coffee, given to her by a gas station attendant one late night when she was stranded with a dead car and an abusive boyfriend. Over the course of our three weeks: we worked with lyrics from Florence and The Machine's song, "Shake it Off" (I'm always dragging that horse around/tonight I'm going to bury him in the ground/.../It's hard to dance/with the devil on your back/so shake him off/oh whoa-o); we dabbled in post-modern dance warm-ups that involve moving to a phrase and a partner creating a supportive mirror for that movement; we traced secret answers to questions from the poet Bhanu Kapil ("How will you live now?") on to each other's backs; we discussed ways to keep a journal that may be less boring and less vulnerable--invisible journal rituals; we used tonglen--a meditation practice that involves locating a negative feeling that belongs to an other, but which is shared by you, drawing it in as a dark column of smoke, and blowing it out, through the feet, as a clear and light-filled gust of compassion for all involved; we made lists of what it means to be "sentenced" in the world (many of the women are there on as an alternative to jail), or in my case, "deformed" as many doctors have said recently--to this, the women offered things like, "I get crucified when something comes up missing." and "The court says i am an addict and I will never get it right. "; we made lists to stand beside those "sentenced" lists of the simple, useful things we do with our hands every day. There were mohawks, neck and arm tattoos, a path to tracking dreams through Lucille Clifton, the news that the Department of Corrections has cut the funding to Rose Manor and the women will be separated--sent out to different rehab centers to complete their journeys. There were tribal markings on the high bones of cheeks. 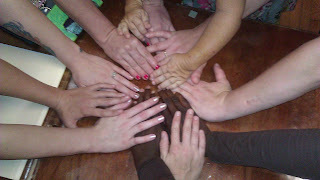 (One of the women is an intern who is studying counseling--she moved here from Nigeria 8 years ago. K. said, "Oh, I thought you had cried so much in your life, you now have those marks."). Thee were pink jumpers and summer colds and D. who when we made the poems for our hands, shared, "I can skin a deer and gut a fish with my hands." There were the stories of being labelled "emotionally handicapped", of parents who lost their lives to addiction or now live in prison with AIDS and the guilt that the women have for showing the same pain to their children. "When you said 'hopeful', I thought of my children." --J. Though the Christensen poem did not use the word "hopeful", so many of the women, connected to the word "unfold", which was there, and translated it as the former..
T., a newcomer to the residential program, while this conversation on Christensen was going on, wrote quickly, quietly. A poem in 5 minutes, in red marker, echoing the poem in our hands, but about her 6-year-old daughter, Sky. Some of the lines from this poem were, "Running, and yet standing still", "fists clenched, holding nothing at all", and "Thank you for teaching me to love and please be patient with me as I continue to learn to learn to love you as you deserve". She began to cry after she read it, not sad tears, per se, and someone confirmed, "Sky is here." A. wrote an apology to her seven-year-old daughter and explained that her own childhood is now something she hopes to purge through the telling and moving forward. /the choice, would he have stayed if he could? For my part, I never wanted to leave Rose Manor, really. Because of the feeling of women rising, waiting it out, wading into it every day. But of course, I want my girls to leave and flourish. Not really girls, but girls as in beginning again.